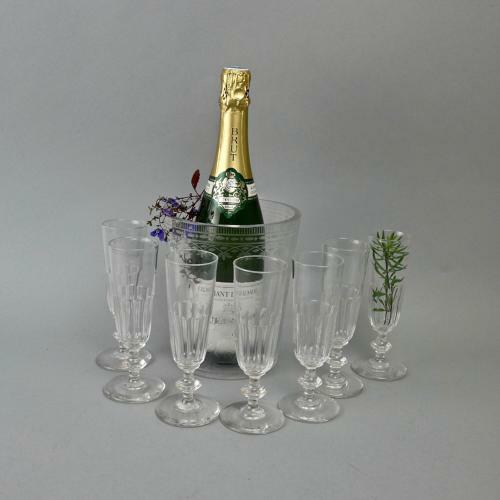 A good set of 7, French crystal champagne flutes. These glasses are made from a heavy, quality, lead crystal and they date from c.1880. They measure approximately 16cm. high by 4.8cm. diameter at the rim and 6.5cm. diameter at the foot but there are very minimal variations as they are all hand blown. Each one has a long, elliptical cut design to the lower section of the glass and a single knopped stem. The bowls of the glasses have a slightly rounded form rather than the more usual, angular shape. They are all in excellent condition.